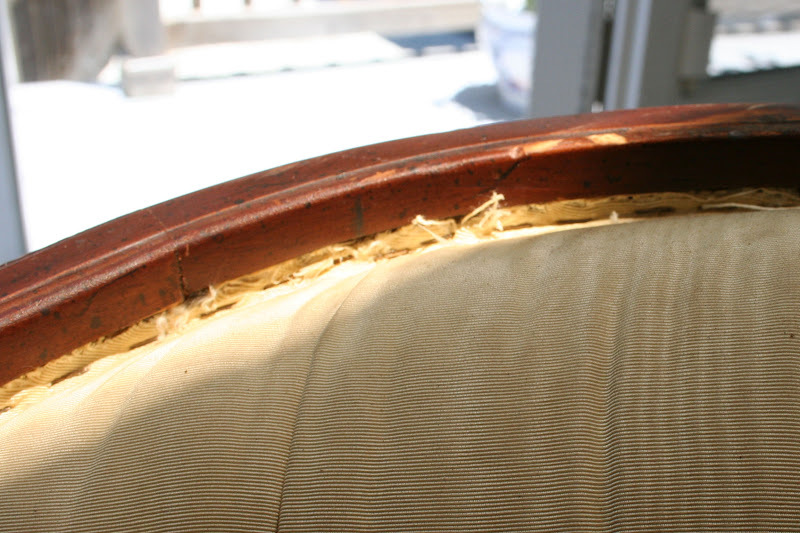 The settee’s wood frame was in good shape, but it needed some tightening and adjusting. Allen helped with this while I took a break and nursed my imaginary bedbug bites. He tightened screws, tightened glued joints, and generally checked over the frame for any major problems. When Allen was done, I set to refinishing the exposed wood. I like dark wood, but this was one of those cheesy, shiny finishes from the 60’s or 70’s. For some reason, speckled finishes were all the rage – someone used a paintbrush to flick stain over dark-stained wood. Why? The wood also had its share of major dents and scratches. I believe the frame might be ash or poplar, though I don’t know that much about wood; the wood is light in color, with a small, subtle grain. Since it was stained so dark, scratches through the finish were especially noticeable, highlighting the wood’s natural color versus the dark finish. Since the foam and padding were already removed, it made a lot of sense to devote an extra eight or ten hours to refinishing the frame. 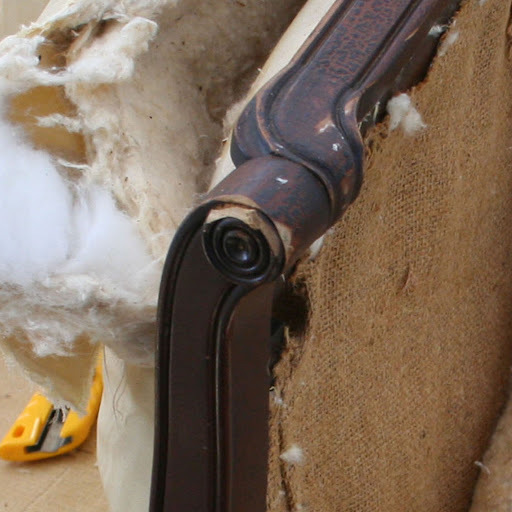 The supplies I used for stripping and refinishing the settee included stripper, a pair of heavy-duty rubber gloves, 1½” and 2” natural fiber paint brushes (foam will melt), a 2” putty knife, a ¾” chisel (this was improvised), fine steel wool, fine sandpaper, cotton rags, wood stain, and tung oil. Dab on a liberal coat of stripper with as little brushing as possible. A film forms over the stripper to stop evaporation. Brushing breaks the film and causes evaporation and drying. Keep the stripper wet even if more applications are necessary, until the BOTTOM coat of paint or finish is ready to be removed. Check for dry spots and reapply stripper to those areas. Give the stripper time to work. many coats of old paint may require up to 30 minutes before removal. Using a putty knife or plastic scraper, remove the paint and deposit it in a waste container. Apply another coat of stripper to facilitate the final cleanup. Scrub the surface clean with steel wool and water. That really says all you need to know. Brush on the stripper in a thick coat, wait a few minutes, and scrape it off lightly, taking care not to scratch the wood. Wipe your stripped finish into a paper bag as you go (plastic will melt). Do this in a well-ventilated area, while wearing heavy-duty gloves. Stripper isn’t nice stuff, and I had several minor chemical burns on my knees and legs before it was through. If you drip some on yourself, wipe it away with a rag, and don’t freak out – it will sting if you leave it, but it won’t do much damage. The stripper you brush on will darken as it dissolves and mixes with the finish, and it should be dark and cloudy when you scrape it off. You may have to go over some areas twice, depending on the amount of finish and your patience level. 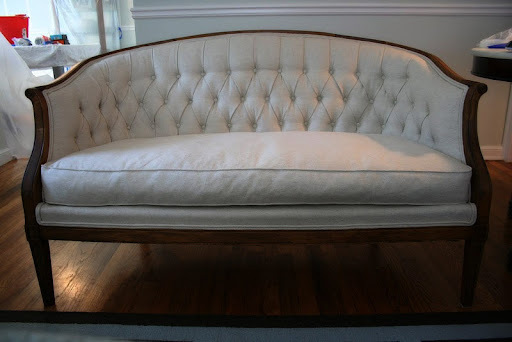 For detailed areas, like the legs on this settee, use a very small putty knife, a wide flat-head screwdriver, or a small wood chisel to gently scrape the stripper of, getting evenly into corners and crevices. Once you’ve scraped off the bulk of the stripper, go over the same area with medium to fine steel wool. This will remove the rest of the stripper and finish. For grooves, you can loop some steel wool over the end of a screwdriver and drag it through lightly. Steel wool will help smooth your surface, so feel free to keep brushing the surfaces even after you feel like the stripper is removed; chances are, there’s always some hiding. Do this in the direction of the grain, even though, against corners or in grooves, it may be tempting to go perpendicular to the grain. Now, sand the piece with fine-grit sandpaper, 300 or so. Allen and I have differing opinions on this process. I feel strongly that the purpose of refinishing is not to remove the darkened patina of the wood, and that you should sand as lightly as possible to achieve an even, smooth surface. Allen believes that light sanding just lightens corners and areas that jut out, making for a piece that has obviously been refinished. I compromised, sanding lightly where I could, and giving closer attention to areas that threatened to look too obviously refinished. Always sand in the directions of the grain. Once you’ve sanded, go over the piece lightly with fine or very fine steel wool, to flatten out the wood fibers and remove sawdust. The steel wool will shed some, so make sure to blow the steel fibers out of cracks and crevices. Now you’re ready to stain! We have quite a collection of medium and dark Minwax stains, and I followed a coat of Provincial (a warm, medium tone) with Dark Walnut (a cool, dark tone). Shake the can very well before you open it, and stir it with a paint stirrer or a popsicle stick once it’s opened. If you want to darken it, you can leave it open overnight. Dip in a cotton rag, and wipe generously onto your unfinished wood. The stain will not take if there’s even a little bit of sealant remaining. Depending on how dark you want the stain, let the stain penetrate for five to fifteen minutes, and then wipe off the excess with another rag. You can find a product called pre-stain wood conditioner, which I’ve never used, but which may be helpful in getting the stain to absorb evenly. Someday I’ll remember to pick some up, as I always have a problem with even absorption. In this case, I simply went back a reapplied stain to stubborn areas. Since I was applying multiple coats of stain to my piece anyway, this helped to even out the whole picture. I was heavy-handed with Provincial, since it was lighter. I really piled it on, and let it sit for ten or twelve minutes. I wiped off the Dark Walnut, on the other hand, after only a minute or two, and I only made a single application of this color. The wood will darken slightly as it ages, and I wanted to avoid the cheesy, shiny, dark finish original to the sofa, so I was really careful with the stain. Stain can also be a little unpredictable in terms or where it will take and how even it will be, especially the darker colors. You can always add, but you’d hate to have to strip the piece again. The Minwax instructions say to repeat after four to six hours if you want darken the finish, but I think of this like I think of mascara – a single coat may involve multiple swipes. Your second coat is another few swipes, once the first coat is dry. I’ve always applied multiple coats and multiple colors in the first round. Often, you won’t need to apply a second coat, unless you’re dealing with stubborn, waxy wood. Oak sometimes behaves this way, and a good sanding (before starting to stain!) will open up the pores, so to speak. My poplar (or ash?) was pretty willing to take stain. After eight to twelve hours, unless humidity is high (and it always is in a Georgia summer), you can apply a finish such as polyurethane or tung oil. Polyurethane is great – very protective, and available in a variety of finishes – but lately, I’ve loved tung oil. Tung oil gives a mellow, matte, natural finish. If you’re using polyurethane, stir the product – don’t shake – and apply to the wood in as thin a coat as possible, rubbing it into the surface of the wood with your paintbrush. The wood will appear to darken and take on a nice sheen. After six hours or so, sand lightly with fine sandpaper, and apply a second coat in the same way. You may apply a third coat if you so desire. Allow the final coat to dry for 24 hours before you even touch it, and let dry 48 hours before it sees any real use. If you use tung oil, stir the product well, and apply with a clean rag. Apply a little at a time, rubbing it into the wood. The Formby's bottle says "similar to the way you would wax a car." Let dry 12 hours, buff very lightly with fine steel wool, and reapply. Do this two or three times. Post-refinishing, the scratches and scuffs actually seem endearing. Refinishing wood furniture can transform cosmetic flaws into charming marks of character and age. I realize this is wrote an old post, but thank you! I have stripped wood of paint, but never of stain - thank you for all of the details. The wood looks fabulous redone!